Overview - Academy Award Winner Kevin Spacey (The Usual Suspects) and young Hollywood super star Kate Boswoth (Superman Returns) star in this clever & adreniline filled heist film. An MIT math whiz is recruited by a teacher to join a specialized team of card counters. They break away from their mentor before casino security finally catches up with them. Based on book "Bringing Down the House." It co-stars Lawrence Fishburne (Matrix Trilogy). '21' is a movie of such glittering surfaces and populated by such good-looking people that's easy to be distracted from the paper-thin story underneath. '21' initially tells a compelling tale of a brilliant but poor undergrad who dreams of attending Harvard Medical School, and falls in with a group of Vegas card-counters to earn his tuition. At first, the allure of the easy jackpot dazzles us as much as him (and this is a great-looking movie), until a series of second-half contrivances and melodramatic cliches undermines the fun. What could have been an original and fascinating character study instead turns into a pretty big cinematic bluff. The film begins promisingly. 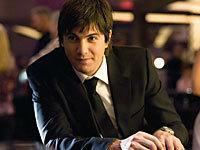 Jim Sturgess ('Across the Universe') stars as M.I.T. prodigy Ben, whose GPA and test scores border on the genius, but who is still unable to secure the required financial aid to attend Harvard. Enter instructor Micky Rosa (Kevin Spacey, also one of the film's producers), who shepherds a shadowy group of elite students in the ways of counting cards. Weekend trips to Vegas have netted the team hundreds of thousands of dollars, and when Rosa spies Ben's unparalleled math skills, he sees a way to raise the take to the millions. These early scenes are well-observed. Sturgess is able to make Ben both likable and multi-faceted, so even the dicey proposition that such a character would have any trouble paying for Harvard comes off as credible. The film's Boston locations also ring authentic, with the cold and gritty locations nicely setting up Jim's soon-to-be-whirlwind introduction to Vegas. Even the Rosa character (which is a pure Hollywood creation) is one we can swallow, as '21' appears poised to explore thematic and moral equations between he and Ben that few mainstream movies rarely tackle. 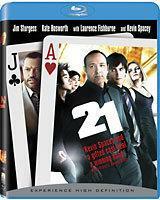 Unfortunately, once the movie hits Vegas, '21' turns into "Attack of the Montages." Director Robert Luketic ('Legally Blonde,' 'Monster in Law') piles on the slick visuals and editing razzmatazz, to the point that the film's second half feels like one very long music video with a few dialogue scenes thrown in. Certainly, this stuff is fun -- Sturgess has elicited our sympathies to the extent that we can't help but want to see Ben succeed (even if he's treading on ethically queasy territory), and Luketic does show much visual flair with his endlessly zigzagging camera. It's just that an unfortunate feeling of familiarity begins to creep in as all the requisite story points are hit with machine-like efficiency, from Spacey's increasingly hammy turn as the devil in a pair of professor's glasses, to Kate Bosworth as Ben's duplicitous love interest, in what is such a rote romantic subplot that it could have been phoned in from any other movie. '21' is so obvious in setting up Ben for his eventual moral fall it feels like one of those '80s Jerry Bruckheimer movies, only about blackjack instead of flashdancing. '21' never does rescues itself from predictability. The film's climax is so constructed to pay off every plot development and character arc in a mannered, traditionally happy Hollywood way that it feels like a betrayal of the early scenes. By the time a band of scheming casino cops (led by Laurence Fishburne) was chasing Ben around the backrooms of the Flamingo like a scene out of some sort of action movie, any realism in '21' was long jettisoned in the need to provide too-pat answers to the film's initially thorny questions. There's no doubt that '21' is never anything less than fun, but it's also a narrative sell-out. '21' shocked many industry observers by grossing nearly $100 million during its domestic theatrical run last winter, turning it into the season's biggest sleeper hit. With no true marquee stars and a story that, on paper, appears boring (who wants to watch B-listers play blackjack for two hours? ), '21' does deserve points for defying the cinematic odds stacked against it. And on pure entertainment value alone, it's easy to see why '21' was a hit. But here's a story (loosely based on a real-life M.I.T. student, no less) that could have been a great deal more. I wouldn't dissuade anyone from renting '21,' but don't expect to hit the jackpot. I remember seeing '21' in the theater, and thinking what a fine Blu-ray it could make. The film may not have big action and explosions, but it is very bright, well-shot and colorful -- perfect for high-def. 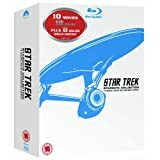 This 1080p/AVC MPEG-4 encode doesn't disappoint, and this is one of the best new releases I've seen from a studio in quite a while. The source is pristine -- there isn't a speck or blemish to be found, grain is minimal, and blacks are spot-on. Contrast is also nicely modulated across the entire grayscale, but stark enough that the image also sparkles. Colors are terrific, too, with the glitzy Vegas exteriors matched by intense interiors of the all-night clubs. The university sequences are intentionally desaturated, but even here the image remains largely natural and fleshtones are accurate. Sharpness is also spot on, and shadow detail superior. To top it off, the encode is also first rate, with no artifacts or other issues. With nary a flaw to be found, '21' looks great. Sony deals '21' Dolby TrueHD 5.1 Surround tracks in English, French, and Portuguese (all 48kHz/24-bit), plus Spanish and Thai options in Dolby Digital 5.1 Surround (640kbps). It's not as smashing as the video, but it certainly presents the film's lively sound design in fine fashion. '21' only really comes alive aurally once it reaches Las Vegas. Here, the surrounds are fully active, with engaging discrete effects, sweet use of score and music, and plenty of sustained atmosphere. Dynamics are likewise excellent, with surprisingly strong low bass for a non-action film, and great clarity to the full frequency range. Dialogue is also firmly rooted in the center channel with no volume balance issues. Conversely, the more mundane scenes are just that, with the mix going front-heavy for little notable atmosphere. This is not a problem given the material, though it's hardly cause for much excitement. These few bland moments aside, however, '21' shouldn't disappoint. Audio Commentary - In a nifty bit of timing, director Robert Luketic and co-producers Michael de Luca & Dana Brunetti sat down to tape this commentary just as '21' was hitting the jackpot at the box office. That gives the track plenty of zing, with the trio talking as much about the fun times they had in Vegas as discussing the flick. That sometimes grates on the nerves (hey, someone else having fun in Sin City ain't so fun to listen to), but there are still plenty of nuggets here to discover. The best bits include a very thorough discussion on the real MIT techs and how they managed to trump the casinos for as long as they did, plus a look at the film's original ending, which was quite trickier. This commentary does come up a bit short as a look at the filmmaking process, but there remains enough here to recommend it. Featurette: "Basic Strategy: A Complete Film Journal" (HD, 25 minutes) - Though not that long, this centerpiece featurette is actually better than the commentary at giving us an overview of '21.' It's actually quite technical, with a look at the film's unusual photographic processes (which eschewed traditional film cameras for the new Genesis HD system), the cinematography, and shooting on location in Las Vegas. Cast participation is more limited (though all the main stars appear), with only sparse comments on how they all learned the ropes of Blackjack. All in all, however, a strong featurette. Featurette: "Money Plays: A Tour of the Good Life" (HD, 7 minutes) - The second featurette takes a look at the production design of '21,' including both the Vegas locations as well as the Boston sequences. Featurette: "21: The Advantage Player" (HD, 5 minutes) - Rather superfluous, this is a brief history of the game of Blackjack, and the various tips and hints the pros use to try and beat the house. Mildly interesting. '21' is an entertaining if very Hollywood take on a classic tale. Despite the glitzy Vegas setting, this is really just your typical rags-to-riches-to-rags morality play, and a bit too engineered for its own good. This Blu-ray is all aces, however, with terrific video, strong audio, and a decent number of extras. '21' is definitely worth a rent, and those who already enjoy the flick certainly shouldn't hesitate to pick up the Blu-ray.